With the Salming Hawk you ensure success on the court. This indoor shoe stands for energy, stability and unrivalled grip. The Salming Hawk comes from the top collection of Salming and that is not only reflected in the fashionable look of the shoe but also in the unique fit and the latest technologies that are brought together in this excellent shoe. The ExoSkeleton technology ensures that the inside and the tongue are connected to the lacing system, giving your foot optimal support. Thanks to this advanced technology the shoe resembles a second skin around your foot. Every part of the shoe has its fixed place which provides stability and protection, and at the same time the shoe is very flexible and pliable, so you can perform optimally on the court. The HexaGrip outsole consists of two layers that ensure maximum stability during explosive movements on the court. The sole is made of a durable, lightweight rubber compound that guarantees the best shock absorption, lowering the risk of injuries. To perfectly stabilize the heel, Salming has developed the new anatomic Ergo Heel Cup that is slightly longer than the average heel part. The ergonomic fit ensures optimal wearing comfort. The RollBar system of the Salming Hawk guarantees the perfect control of the foot at the moment you take a step. The curvature in the outsole facilitates your forward movements and thanks to this you get to the ball more quickly. The top of the Salming Hawk is made of a mesh-like fabric that ensures good air circulation on the inside of the shoe, keeping your feet dry and cool. The reinforced inserts on the nose of the shoe prevent the shoe from wearing out too soon. 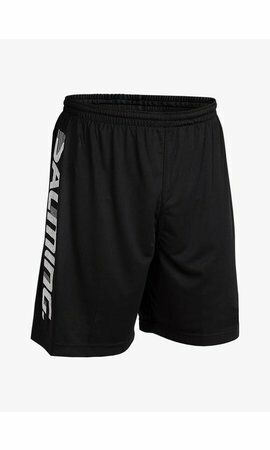 With the Salming Hawk you impress your opponent and the spectators. The unique colour combination of fluo green with navy and the transparent sole give the shoe a dynamic and sturdy look. Images of a hawk on the side, on the inside and on the bottom of the sole make the shoe look even more stylish. 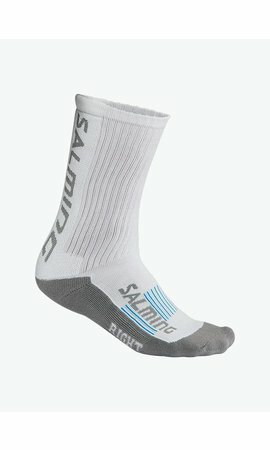 The Salming logo is printed both on the heel and on the sides of the Salming Hawk.